The Smith College Copy & Print Services department services all student, faculty and staff copy and print needs. Mail Services, located on the garden level of the Campus Center, handles all student, faculty and staff mail services. Please allow a 48 to 72 hour processing lead time for all copying/printing jobs. We also offer scoring, perforation and numbering. Call extension 2600 for pricing. 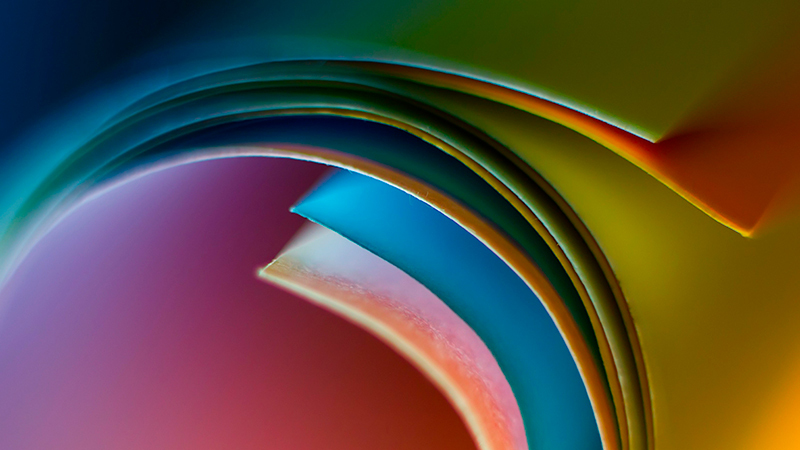 We can provide clear plastic cover(s), black vinyl backing or print covers on cardstock for no additional charge. Business cards for faculty and staff are available from Copy & Print Services. The cost is $32 for 250 cards. Call us at extension 2600 for more information. Did you get a quote from somewhere else? We can give you a better price! Call Copy & Print Services at extension 2600 or email copyprint@smith.edu. Print jobs may be submitted online. Before begining a large project, please call extension 2600 to ensure your files will print out properly. Email all printing requests to copyprint@smith.edu. Attach the file(s) to be printed. Extremely large files may be put into the Copy and Mail Services (CSv) general dropbox on Admin1. Contact us for help navigating the network. Attach a Copying & Printing Order Form (below). When the PDF order form opens, save the file by using the Acrobat disc icon, not from the File menu. Attach the order form with the files to be printed. 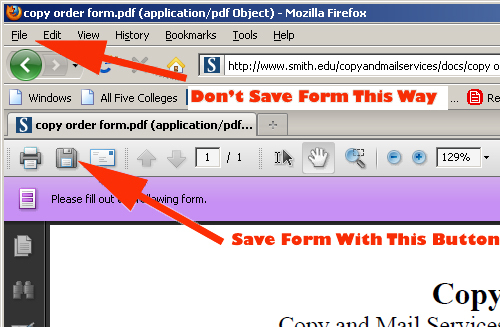 See image below for important information on saving the pdf form to your computer. Don't use the browser menu bar to save the form. Instead, use the PDF save icon. You can deliver your materials in person. Closed daily from 1 to 2 p.m.
Print out an order form, or submit with a carbonless printing order form (call to request forms), and put the job in campus mail addressed to Copy and Mail Services.